The royal vizier of Agrabah. Jafar is unprincipled and ruthless in pursuit of his aims. Now he's using the Heartless to try to take over the city. The vizier of Agrabah. He joined forces with Maleficent and tried to control the Heartless. He gained control of the lamp and became a powerful genie, but was defeated by Sora and his friends. A sorcerer and Agrabah's royal vizier. Jafar stole the magic lamp from Aladdin and, with Genie's power, schemed to become ruler of Agrabah. Before he became an evil genie, Jafar was the Sultan's royal vizier. The last time we were in Agrabah, Jafar was trying to use the Heartless to take over the city. He even got control of Aladdin's pal Genie and wished to become a powerful genie himself. Aladdin, Sora, and his friends joined together to defeat Jafar, and imprisoned him in his own lamp. A wizard who served as royal vizier in Agrabah's palace. The bugs plaguing the datascape version of Agrabah provided Jafar with just the tool he needed to seize the throne: a fake lamp Pete created from data. Later, Jafar used the real lamp, stolen from Aladdin, to become an all-powerful genie. In the end, though, he was imprisoned within yet another lamp: his own. The Royal Vizier of Agrabah. A sinister man, he'll stop at nothing to get what he wants. "Genie! My final wish! I want you to make me an all-powerful genie!" Jafar is a recurring antagonist in the Kingdom Hearts series. Originating in Disney's Aladdin, he is a member of Maleficent's council of villains, and appears to be her second-in-command. He is the royal vizier of Agrabah. Two-faced and cunning, Jafar seeks the demise of Aladdin and to rule Agrabah as sultan. Jafar convenes with Maleficent's council. In the meantime, Jafar has been using the Heartless to cause chaos in Agrabah. Using the confusion to his advantage, Jafar took control from the Sultan and put the citizens under house arrest, leaving the city empty; without potential prey to distract them, the Heartless could focus on searching for the Keyhole. Maleficent orders Jafar to kidnap Princess Jasmine, one of the seven Princesses of Heart, and she warns him not to rely too fully on the darkness, or else he may lose his heart. Just as Jafar locates the princess and moves to capture her, Sora, Donald, and Goofy arrive and help her get away. Jafar eventually manages to capture Jasmine, but he is confronted by the Sora and company, who have joined forces with Aladdin. Aladdin tries to save Jasmine from Jafar by using Genie's powers, but Jafar's parrot Iago manages to steal the magic lamp, to which Genie is bound. Jafar summons the Pot Centipede to finish off the heroes while he makes his exit. The pursuit of Jafar leads Sora and his friends to the Cave of Wonders, where the Guardian of the Cave is possessed by darkness. As Sora and company deal with the Guardian, Jafar retreats to the Lamp Chamber. While there, he uses his first wish to find Agrabah's Keyhole. The Keyhole is revealed on the far side of the chamber; shortly afterward, Sora, Donald, Goofy, and Aladdin arrive. They battle Jafar; the royal vizier uses his second wish to have Genie fight alongside him against Sora and the others. Jafar is defeated in the end, but he uses his third and final wish to transform himself into an all-powerful Genie. Sora, Donald, Goofy, and Aladdin venture into the deepest part of the Cave of Wonders; there, they fight Jafar once again. After his second defeat, Jafar is sucked into a magic lamp of his own along with Iago. Hades, Captain Hook, and Riku converse about Jafar's chances against Sora; Hades states his belief that the vizier might have triumphed if Riku had been there to support him. Maleficent replies to this statement, claiming Jafar served his purpose and was "beyond help, consumed by his own hatred." Jafar returns in a memory-based version of Agrabah that Sora visits during his journey in Castle Oblivion. The royal vizier uses the Heartless to take over Agrabah; he tricks Aladdin into getting the lamp in an attempt to make Jasmine marry him. Jafar steals the lamp from Aladdin, and he uses his first wish to have the Genie fetch Jasmine for himself. Aladdin and Sora trick Jafar into using up his second wish to make the Genie to protect him from a sneak attack; upon discovering this, he uses his third and final wish to become an all-powerful Genie. Jafar teleports Sora and his friends to the deepest part of the Cave of Wonders and attacks them; the protagonists defeat him by trapping him in a lamp of his own. During Riku's visit to the memory-based version of Agrabah, he fights Jafar, who represents his inner darkness. One year after Sora's journey in Castle Oblivion, Jafar's lamp is found by the Peddler. Maleficent sends Pete to Agrabah to get the lamp, release Jafar, and turn the royal vizier into a Heartless. Unfortunately for Pete, Sora and his friends arrive in Agrabah, as well. Sora, Donald, and Goofy travel to the Cave of Wonders after reuniting with Aladdin; there, they find a treasure to give to the Peddler in exchange for Jafar's lamp. Sora returns from the Cave of Wonders to find Pete chasing the Peddler in an attempt to steal the lamp; Sora follows the two all the way to the Palace. Iago, who managed to escape from the lamp and wants to prove that he has reformed to Aladdin, snatches the lamp from Pete before he has a chance to release Jafar. Angered, Pete summons the Blizzard Lord and Volcanic Lord, but the Heartless are dispatched by Sora, who helps Aladdin seal away Jafar's lamp. Jafar transformed into a genie again. Due to the manipulations of Organization XIII, the Peddler finds Jafar's lamp again and releases the royal vizier. Jafar forces Iago to keep Sora occupied while he makes his way to the Palace; the parrot does as ordered and takes Sora, Donald, Goofy, and Aladdin to the Desert Ruins, where they face a ghostly version of Jafar, instead. When the real Jafar is nowhere to be found, Sora and company realize they have been tricked. Iago tells them Jafar is attacking the Palace; Sora and friends rush off to stop him. Upon arriving at the Palace, Sora, Donald, Goofy, and Aladdin find Jafar tormenting Jasmine, whom he has chained to the gate. Jafar tries to eliminate Aladdin by launching a beam of dark lightning at him, but Iago intercepts this and is knocked unconscious. Jafar assumes his Genie form and rises into the sky, determined to finish Sora and his friends off once and for all. Sora gives chase, riding on Aladdin's magic carpet, and he battles the massive genie one-on-one, leading to the destruction of half of Agrabah. In the end, Sora emerges victorious, Jafar explodes, and his lamp dissolves into darkness. A data version of Jajar appears in the Datascape version of Agrabah. Much like his real counterpart, Jafar tricked Aladdin into going to the Cave of Wonders to bring back the magic lamp, although Aladdin planned to use it to win Jasmine's heart. Jafar was not too pleased with this, using the Heartless to try taking it back from him. However, Data-Sora defeated his minions, forcing Jafar to flee. While contemplating what to do, Jafar was met by Pete who held what Jafar thought was the real lamp. Pete had actually used the glitches to create a copy of the lamp; it can grant wishes within the datascape, but lacks a genie. Mistaking the technical terminology for some kind of powerful sorcery, Jafar eagerly grabbed the lamp and was advised by Pete to plunge Agrabah into darkness. Using his first wish, Jafar gained great power. Time stopped in Agrabah, allowing Jafar to kidnap Jasmine with the intent of using his last wish to make her his bride. In the meantime, he had Iago unaffected by the time-freeze steal the real lamp to double his wishes. However, as the Keyblade protects Data-Sora, he was able to give chase. Seeing him unaffected by his magic, Jafar created phantoms of himself to chase Sora. Sora eventually gets the lamp and ends up at the Cave of Wonders, where Jafar is hiding. Using his second wish, Jafar turns the Cave into a gauntlet of booby traps. When Data-Sora confronts him in the Lamp Chamber, Jafar offers a position as his minion due to being impressed with him; he offers him any wish he desires. Data-Sora jokes that he wishes Aladdin was Sultan. Seeing Data-Sora refuses to join him, Jafar uses his last wish to become a genie and vanishes into the Keyhole. Data-Sora confronts him in a lava chamber, where Iago is carrying around the fake lamp, now linked to Jafar. Knocking out Iago, Data-Sora imprisons Jafar inside the very lamp he used for all his trickery. Jafar is a tall, thin, bony man dressed in extravagant clothing. He is always seen carrying his gold, ruby-eyed, cobra scepter to supplement his magical powers. Jafar wears black robes that reach the ground overtop a red-violet garment with bell sleeves. Underneath this second garment, Jafar wears yet another shirt, this one black with very close-fitting sleeves that reach his wrists. The shoulders of his outer robe are pointed and connect to a long, billowing black cape with a blood red interior. Jafar's shoes are brown and their tips curl inward. A red-violet sash is tied around Jafar's waist. Jafar also wears an odd, light-colored garment that covers his neck, the back of his head, and his chest. Jafar has a twisted, black goatee and a faint mustache, and he also wears grey eyeshadow. He sports a distinctive black mitre, with a thin, yellow pattern wrapping around the middle, with what seems to be a ruby set in the front, and a bright red feather placed just above it. More red-violet cloth hangs from the mitre, draping over Jafar's shoulders. Once Jafar makes his third wish, he takes on the form of a genie. In his transformed state, Jafar's skin becomes blood red, his ears become pointed, his right ear gains a gold piercing, his hair is tied in a topknot, and his eyes become completely yellow. He retains his red-violet sash, and his five-fingered hands gain short, black claws. He also grows significantly in size. In Kingdom Hearts V CAST, Jafar takes the form of a cobra. Jafar is very cool and calculated, yet vicious and an amoral sorcerer who Maleficent regarded as "Beyond help. Consumed by his own hatred." He is seen in a mostly cool manner, yet is easily angered. He is sly, ruthless, and arrogant, ignoring Maleficent's warning about keeping his heart open to darkness for too long, simply replying "Your concern is touching, but hardly necessary". In Kingdom Hearts II, he is slightly more impulsive than before, but not quite as arrogant. 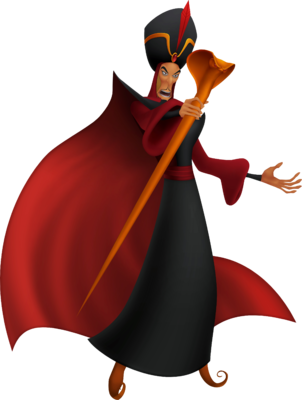 Jafar appears in three Kingdom Hearts games as a boss. In the first game, he fights Sora in the Cave of Wonders by using his staff and magic. During this fight, Jafar typically stands on one of the stone blocks located around the area and attacks from above with a continuous beam of fire and a large ice storm in the center area of the room, occasionally drifting down for a more personal assault with his staff. After he is damaged enough in this confrontation, he turns into a ball of light and floats away, then resumes human form to continue the cycle again. In addition, when hit with Gravity magic, Jafar forms a protective shield around himself. In the second part of the battle, Jafar becomes a powerful Genie and throws fireballs at Sora and friends. When defeated, he is sealed up into a magic lamp. Jafar uses the same attacks in Chain of Memories. In Kingdom Hearts II, Jafar returns more powerful than ever in his genie form. Sora rides on the magic carpet as he and Jafar face off. Jafar can teleport Sora to another dimension in this battle and also throw buildings at Sora, as well as other projectiles (such as fireballs) and can temporarily paralyze Sora with a flash of light from his eyes. If Sora depletes the HP in Jafar's chest, then he can use the Reaction Commands Roll Up and Spin Burst, in which he grabs Jafar's tail, wraps him up, and spins him around. At the end of the move, Jafar is left briefly dazed and open for some attacks. Jafar first made his appearance in Aladdin as the Sultan's power-hungry vizier. In his quest to seek someone suitable to enter the Cave of Wonders, "a diamond in the rough", led him to the street urchin Aladdin. With Aladdin's help, he would almost acquire an ordinary oil lamp which actually housed an all-powerful genie. However, due to unforeseen consequences, Jafar lost the lamp and his quest for power was thwarted unintentionally by Aladdin under the false identity Prince Ali al Ababwaa. But Jafar would not give up and used his parrot companion, Iago, to steal the lamp, becoming the genie's new master and assuming total control over Agrabah using newfound powers he had wished for. He attempted to banish Aladdin to the ends of the Earth but failed as Aladdin showed up for one last showdown. Desperate, Jafar used his final wish to become an all-powerful genie but was tricked into being contained inside a lamp by Aladdin and flung out into the desert by Genie. In The Return of Jafar, Iago escapes the lamp and throws it down a well, and the thief Abis Mal finds it. Since he found the lamp Abis Mal is technically Jafar's master, but he is so inept and cowardly that Jafar easily pushes him around and gives him orders, tricking him into wasting two of his three wishes by purposefully misinterpreting them so they backfire. Jafar arranges for Aladdin to be taken away from the city by Iago while he imprisons Jasmine and the Sultan and takes over Agrabah. Aladdin returns and engages Jafar in a final battle, and is nearly killed by Jafar's genie form, when Iago has a change of heart and intervenes to destroy Jafar's lamp, destroying Jafar for good. This page was last edited on 2 April 2019, at 10:58.